We feature almost 1,200 catered chalets in the Alps which are managed by over 160 different chalet companies. These chalet companies range from the very large (with over 100 properties) to the very small (one owner managed property), and from simple good value to outlandish luxury. Each of the separate chalet companies provide what is called a 'catered chalet' holiday whereby chalet staff provide the three standard daily meals: breakfast, afternoon tea and dinner. However, there are fairly wide difference between one chalet company's 'chalet cooking' and another's. We look into the world of catered chalet holidays to help you understand the good and the bad. Most chalet staff 'live out' so their day will start with a cold (usually dark) early morning walk to your chalet. They will clear away any glasses left out from the night before, prepare the fireplace in readiness for evening use, layout the breakfast things and get the coffee brewing. Some chalet companies will offer a 'wake up' morning tea or coffee delivery service to your room so if you like to wake to a fresh mug of tea then it's worth checking this. The quality of breakfast can vary considerably from chalet company to chalet company. At the lower end of the price spectrum expect fresh bread (which is often the best item), cheap jams, fruit juice made from concentrate, cheap cereals, UHT milk, low grade coffee and tea and a 'cooked option' which will consist of one egg per person and one other item such as a sausage, rasher of bacon or small portion of beans. A good test of your chalet staff's culinary skills is to ask for scrambled eggs on your first morning and judge by what is offered. Given that at the lower end of the price grade your chalet host is likely to be a poorly trained 'gap year' student the simple scrambled eggs test is often enough to tell if they can cook or not. The other bug-bear to be aware of on a cheaper chalet holiday is that the croissants (if offered) are likely to be frozen rather than fresh. And as hard as it may seem we know from our own bitter experience that a frozen croissant can be burned in the oven just as easily as the scrambled eggs can be over-cooked. As you progress up the price scale your breakfast will improve. The quality of the ingredients used for your cooked option and the range & quality of breads, juice and cereals will improve. At the upper end you will receive a breakfast that would rival that produced by any 5 star luxury hotel. Freshly squeezed juice, smoothies, freshly made waffles with maple syrup, delicious yoghurts, proper fresh coffee, fresh croissants and pain au chocolat (if in France), tropical fresh fruit, a full cooked English breakfast if you want and -'yay' - scrambled eggs done properly. Whilst you are eating breakfast your chalet staff will knock up a cake (sometimes biscuits) and get it in the oven. The standard cakes on offer are lemon drizzle, yoghurt and carrot cake. However, there are many variations on a theme so that your afternoon cake or biscuits can take many forms. Whilst your cake is baking, and after guests have left for the day's skiing, your chalet host will make the beds and clean bathrooms. Breakfast things will be cleared away and the chalet generally made ship shape for your return from the slopes later in the day. Finally, before leaving the chalet (at around 11am) your chalet host will put the cake on the dining table along with side plates and mugs for tea. 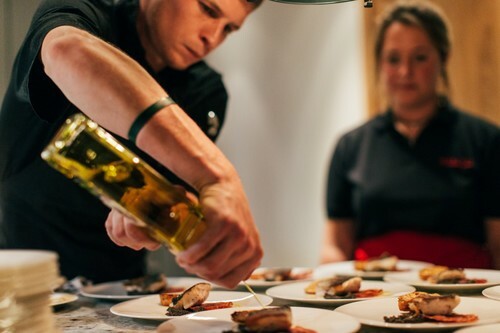 Your chalet staff will return to your chalet at around 6pm to prepare dinner and make the evening canapés. If you have children in your party they will return a little earlier to make a high tea for them. The cheaper chalet holiday companies generally will not provide canapés before dinner. And for those that do the quality and quantity will vary considerably - at the cheaper end of the market you will be served a bowl of peanuts, a packet of tortilla chips or a few Ritz crackers. With increased holiday price comes a slightly better quality of canapés - olives, or maybe cheese & pineapple on sticks, or cream cheese on crackers. 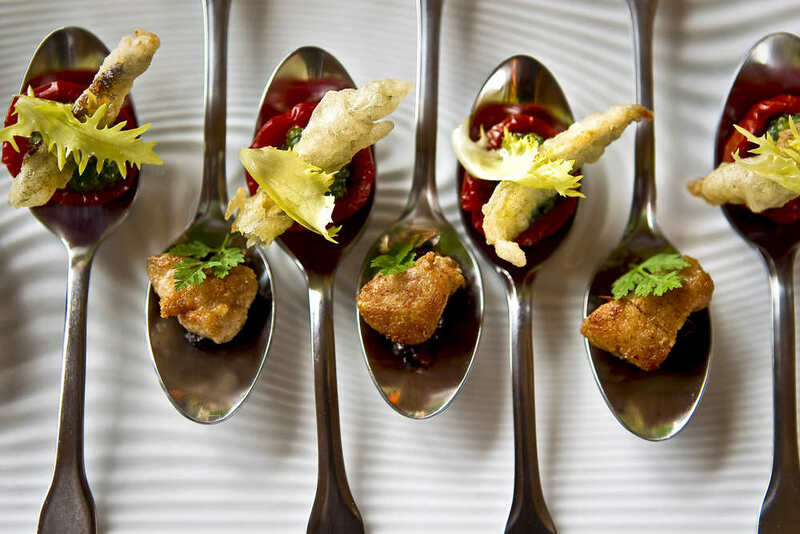 At the top of the price ladder you will simply have your taste buds blown away by superb nibbles made by a professional chef eager to show off his or her culinary skills. Nearly every catered chalet will serve what is then loosely described as a "three (or sometimes four) course dinner with complimentary wine". We think by now you have the picture in that there is a very wide gulf between what the cheaper and the very best chalet holiday companies provide. Beware the cheaper chalet company that dress up their dinner offerings with fancy sounding menus. In our opinion it would be better for them to serve simple, tasty and well prepared dishes such as lasagne or shepherds pie rather than something fancy sounding which is well beyond the skill level of the chalet host. Wine is included with dinner as a complimentary treat for adults but of course the quality varies hugely. Back in the 1980's Bladon Lines chalet holidays were branded for some reason with a red, blue and yellow parrot logo. The wines on offer with their chalet dinners, with no pretensions of grandeur, were named affectionately after their parrot logo. The red was therefore labelled as 'Parrot Claret' and the white as 'Parrot-fin'. Needless to say neither variety was particularly drinkable. Despite this light hearted start in the world of viniculture Simon Bladon went on in 2004 to establish Jenkyn Place Vineyard, Hampshire, which today produces some of the finest sparkling white wine in the UK. Please note that with some chalet holiday companies wine is only served whilst dinner is in progress. Once the coffee is on the table, dinner is deemed over and the supply of complimentary wine dries up. If you are a party that likes to keep drinking long after dinner has finished there are plenty of chalet companies that allow guests to simply help themselves from an endless supply of red and white wine. Please check with us if this is something that is important to you so that we can recommend the appropriate holidays to you. Generally your chalet staff will cook a set two-week menu plan. This allows companies to budget effectively and also allows chalet staff to learn how to cook 12 dinners with a degree of confidence and panache. Although dinners in a chalet operate loosely on a ‘table d’hôte’ system (ie you get what you are given) nearly all chalet companies will be able to cope well with the basic special dietary requirements of a vegetarian. If members of your party have more specific dietary requirements requiring either dairy free or gluten free meals it is best to check before booking that this can be catered for. You should also note that special diets are charged extra at approximately £50 per person per week. We have been selling catered chalet holidays since 1992 and are today recognised as one of the world's leading specialists in selling catered chalet holidays. Don't forget that our advice and holiday booking service is completely free of charge. We would be delighted to answer and of your questions and help you book the perfect catered chalet for your next ski holiday.